Only one big hornback strap can be made out of an entire piece of croc hide. 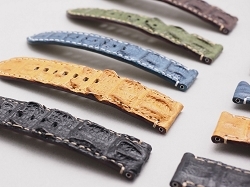 Ted Su Straps is established in 2004 focusing on luxurious handmade watch straps especially for Panerai and Rolex. Over the years, we have expanded our product line to most of the watch brands in the market such as IWC, Patek Philippe, Audemars Piguet, Cartier, Bell & Ross, Omega and more. We are a team of makers who love to create. We create our own tools and our own methods of producing the best products. We even make our own rubber straps: the "Concept Rubber" for 44mm Panerai Luminor Marina and the "FIN" for Rolex sports models such as Submariner and GMT-Master II. This is something rarely seen in small business like us. We also invented the use of cork as padding in the straps. Natural cork is resistant to moisture (sweat), so it doesn't absorb human sweat which is the no.1 cause of bad odour. Most strap manufacturer uses foam, sponge or even paper as padding. You can imagine how the strap will smell in a few weeks. Cork also prolongs durability as it self balances the moisture content inside the strap. Excess moisture is one of the biggest enemies to leather goods. 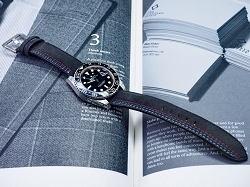 Panerai and Rolex straps are our specialty, but we can custom make watch straps for most watch models on the market too. Please feel free to contact us. Simply provide us with pictures of your watch or the model name, and we'll find out the rest. If you don't know how to measure your wrist size, please visit our blog for instructions. The average lead time for a custom order is about 15 days. We ship by EMS to most parts of the world ($20 usd per order. Order as many as you want). EMS is now very reliable and efficient. We also offer free shipping by registered airmail. It takes about 10-15 working days. We are not affiliated with any of the watch brands mentioned above.